1,000 Cooks for the Cure starts this Friday. 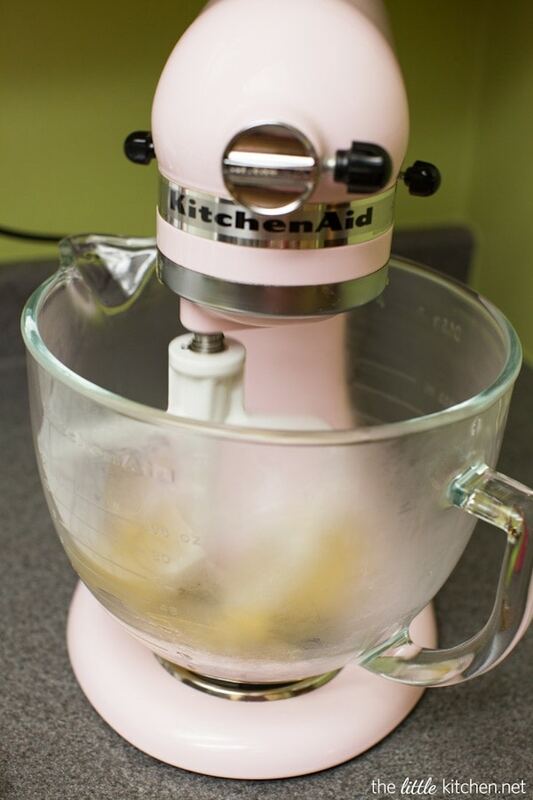 It’s a program that KitchenAid does in partnership with Susan G. Komen for the Cure. The goal is to enlist 1,000 cooks from the U.S. to host a get-together with friends, family or colleagues anytime from July 18-27, 2014. I’m proud to have participate in 1,000 Cooks for the Cure for a few years now. Your party can be as fancy or simple as you want it. For example, I’m in a Bunko group, we all take turns hosting a different month and because 1,000 Cooks for the Cure is in July, I always request to host in July. Most everyone brings pink food and desserts, I ask for donations and have prizes or do a little party favor. This year, I’m giving each person who attends the Bunko party a jar of my homemade taco seasoning. I’m proud to throw the party and be a part of 1,000 Cooks for the Cure. I love that one of my favorite brands supports a cause that’s near and dear to me. My grandmother is a breast cancer survivor and I’m a longtime supporter of Komen for the Cure! Sign up to host a party –> Today! I recently went to one of my favorite restaurants and had these fried dough “pigtails” and I told my friend I have to try to make these into little donuts at home. 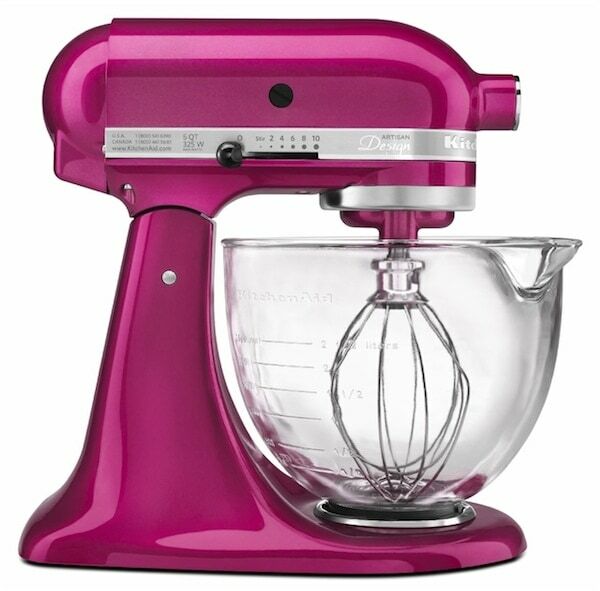 When KitchenAid emailed to ask me to participate and help promote 1,000 Cooks for the Cure again, I knew I wanted to try to make these but I had to think about making something pink for them! So I added a strawberry glaze and it’s perfect! 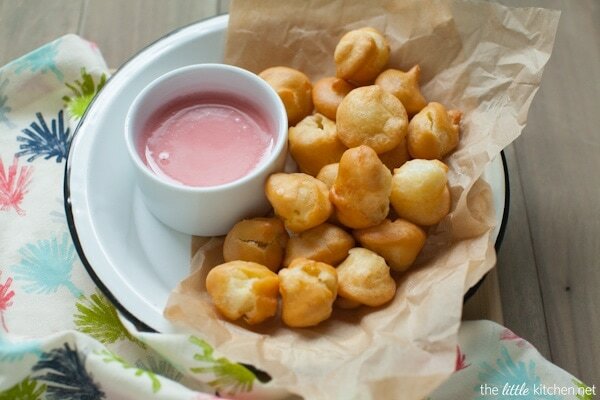 Make the strawberry sauce for the glaze. Cook the strawberries and then let it cool. Melt the butter and make the dough on the stove. This was different for me, I had never done this before! 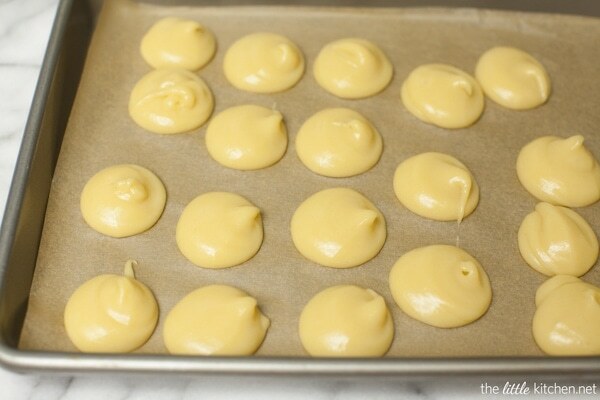 Place the dough in your stand mixer and mix on low until all of that steam is gone. Can you see the steam in the glass bowl? This is my trusty pink Cook for the Cure KitchenAid stand mixer that I bought years ago back in my crazy, fun, mega cake decorating days! PS Love love the glass bowl, it’s a must! This is after adding both eggs. All done. It’s a very wet dough. And pipe circles. Place these in the freezer to firm up. While that’s firming up, I heat up the oil to fry the donuts and mix the glaze. Serve these immediately! 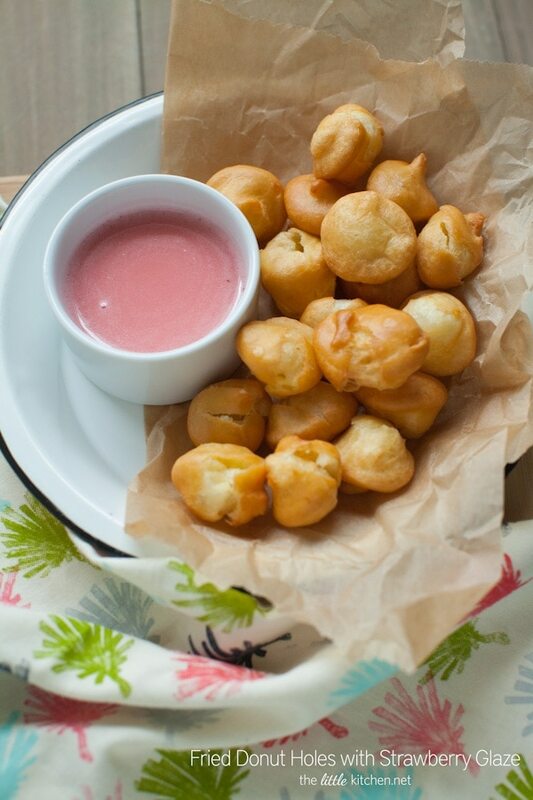 These little fried little pockets of goodness are not super sweet and go perfect with the sweet strawberry glaze. And even better or not better but I bet you can’t eat just one! 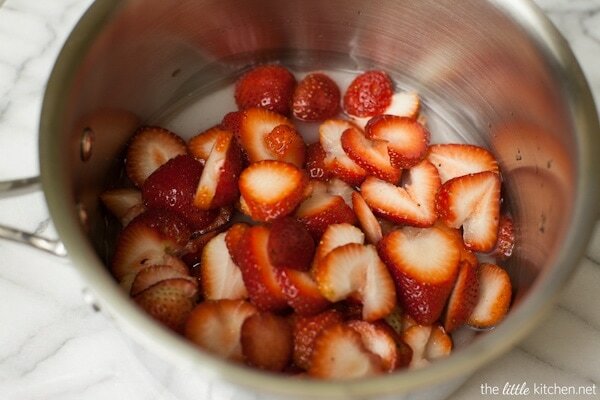 Place strawberries, sugar and water into a small saucepan and bring to a boil. Just as it boils, remove the pan from the heat and allow to cool. 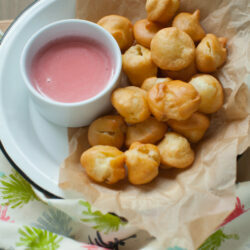 You can start on the fried donut holes as the strawberries cool. 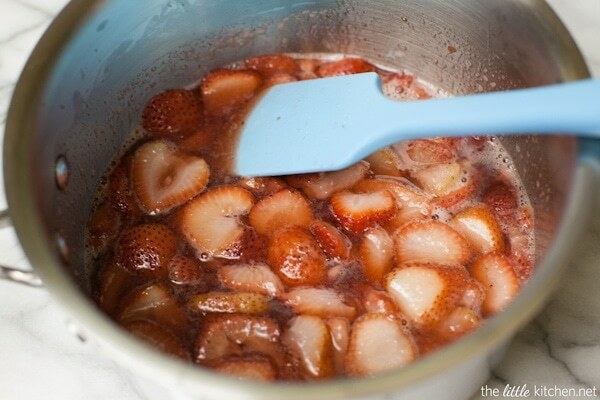 Strain the strawberries until you're left with a syrup (this makes about a cup of syrup). When you're done making the dough for the donuts, clean the bowl of your stand mixer and paddle attachment. Add strained strawberry syrup, powdered sugar and mix on low. Add milk 1 tablespoon at a time. 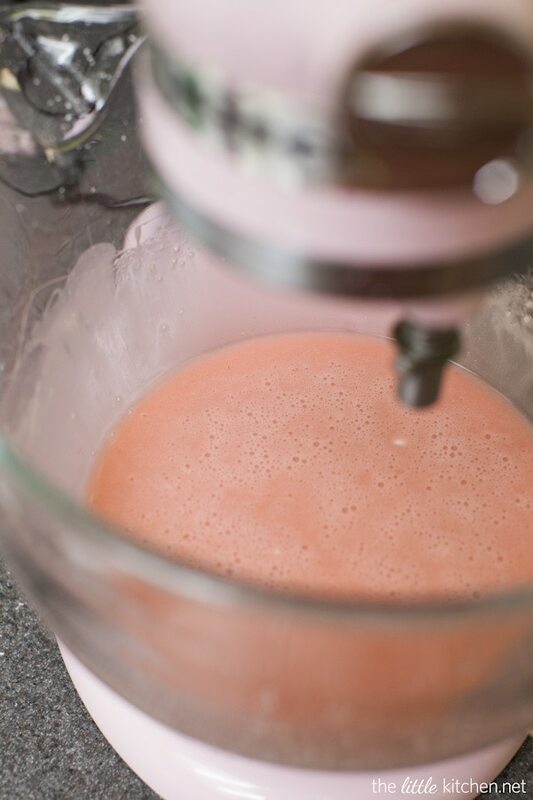 Once it's mixed together, increase speed to medium and mix for 2 to 3 minutes. Place glaze in a tightly closed container and refrigerate until you're ready to use it. 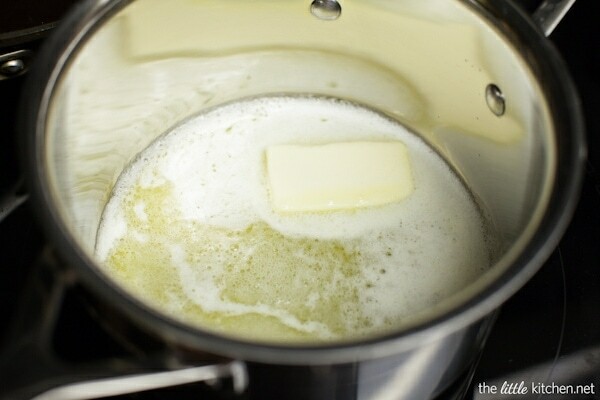 Add water, butter, salt and sugar to a medium saucepan and melt butter on low heat. Increase heat and bring to boiling. Once it starts boiling, remove from heat and add flour. Add saucepan back to the heat (but lowered than before), use a spatula to mix vigorously. Stir until dough forms and there's a film of dough on the bottom of the pan. The dough should pull away from the sides. This takes about 3 to 4 minutes. 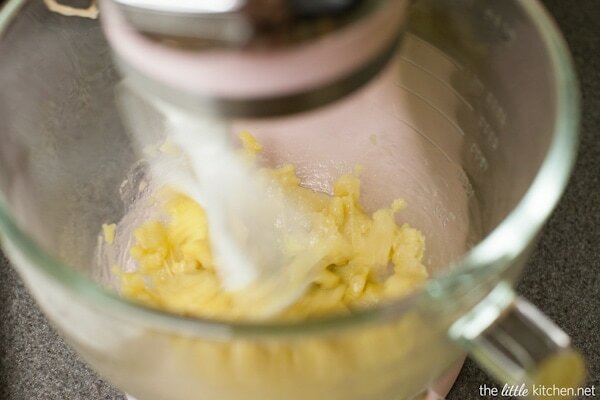 Place dough in the bowl of your stand mixer. Beat on low with the paddle attachment until the dough stops releasing steam. Add one egg at a time, mix thoroughly. 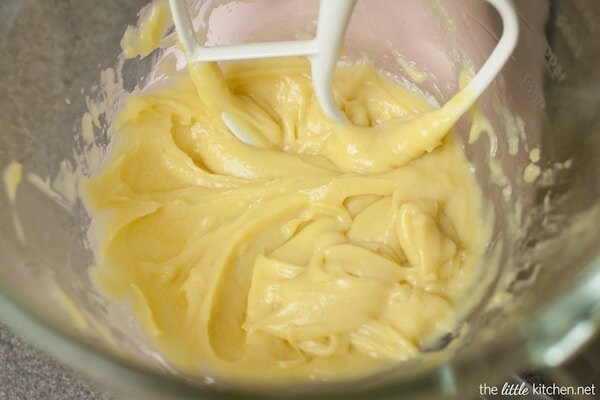 Mix well for 2 to 3 minutes, until dough is fully incorporated and resembles a wet dough. 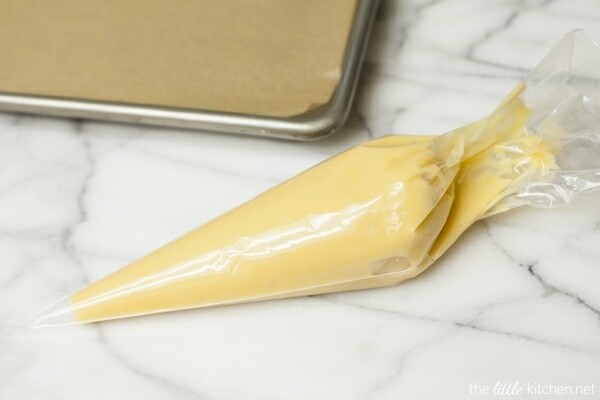 Place dough in a piping bag. Cut the end and pipe round shapes onto the baking sheet with parchment paper. Place pan in the freezer to allow the dough to firm up, about 15 to 20 minutes. Heat oil in a large French oven to about 350 degrees F. Take firm dough direclty from the freezer and carefully place them in the oil (probably will need to fy in two batches, place the pan back into the freezer so that the dough remains firm). Fry for 3 minutes or until golden brown. Place on a plate lined with paper towels and allow the oil to drain. Serve immediately. Be sure to sign up to host a party! And surprise! Be sure to return this Friday, I’m going to be giving one of these away!